ALOPRIM (allopurinol sodium) for Injection is the brand name for allopurinol, a xanthine oxidase inhibitor. ALOPRIM (allopurinol sodium) for Injection is a sterile solution for intravenous infusion only. It is available in vials as the sterile lyophilized sodium salt of allopurinol equivalent to 500 mg of allopurinol. ALOPRIM (allopurinol sodium) for Injection contains no preservatives. The pKa of allopurinol sodium is 9.31. Allopurinol acts on purine catabolism without disrupting the biosynthesis of purines. It reduces the production of uric acid by inhibiting the biochemical reactions immediately preceding its formation. The degree of this decrease is dose dependent. Allopurinol is a structural analogue of the natural purine base, hypoxanthine. 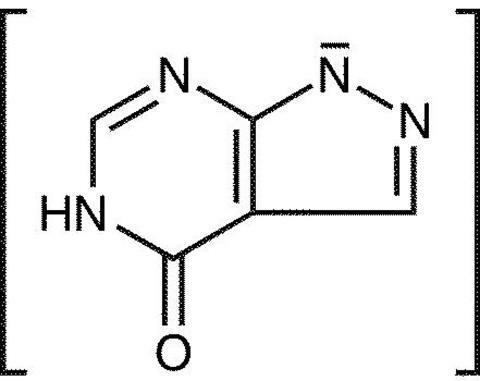 It is an inhibitor of xanthine oxidase, the enzyme responsible for the conversion of hypoxanthine to xanthine and of xanthine to uric acid, the end product of purine metabolism in man. Allopurinol is metabolized to the corresponding xanthine analogue, oxypurinol (alloxanthine), which also is an inhibitor of xanthine oxidase. Reutilization of both hypoxanthine and xanthine for nucleotide and nucleic acid synthesis is markedly enhanced when their oxidations are inhibited by allopurinol and oxypurinol. This reutilization does not disrupt normal nucleic acid anabolism, however, because feedback inhibition is an integral part of purine biosynthesis. As a result of xanthine oxidase inhibition, the serum concentration of hypoxanthine plus xanthine in patients receiving allopurinol for treatment of hyperuricemia is usually in the range of 0.3 to 0.4 mg/dL compared to a normal level of approximately 0.15 mg/dL. A maximum of 0.9 mg/dL of these oxypurines has been reported when the serum urate was lowered to less than 2 mg/dL by high doses of allopurinol. These values are far below the saturation levels, at which point their precipitation would be expected to occur (above 7 mg/dL). The renal clearance of hypoxanthine and xanthine is at least 10 times greater than that of uric acid. The increased xanthine and hypoxanthine in the urine have not been accompanied by problems of nephrolithiasis. There are isolated case reports of xanthine crystalluria in patients who were treated with oral allopurinol. The action of oral allopurinol differs from that of uricosuric agents, which lower the serum uric acid level by increasing urinary excretion of uric acid. Allopurinol reduces both the serum and urinary uric acid levels by inhibiting the formation of uric acid. The use of allopurinol to block the formation of urates avoids the hazard of increased renal excretion of uric acid posed by uricosuric drugs. PHARMACOKINETICS: Following intravenous administration in six healthy male and female subjects, allopurinol was rapidly eliminated from the systemic circulation primarily via oxidative metabolism to oxypurinol, with no detectable plasma concentration of allopurinol after 5 hours post dosing. Approximately 12% of the allopurinol intravenous dose was excreted unchanged, 76% excreted as oxypurinol, and the remaining dose excreted as riboside conjugates in the urine. The rapid conversion of allopurinol to oxypurinol was not significantly different after repeated allopurinol dosing. Oxypurinol was present in systemic circulation in much higher concentrations and for a much longer period than allopurinol; thus, it is generally believed that the pharmacological action of allopurinol is mediated via oxypurinol. Oxypurinol was primarily eliminated unchanged in urine by glomerular filtration and tubular reabsorption, with a net renal clearance of about 30 mL/min. 100 mg i.v. 300 mg i.v. 100 mg p.o. * 300 mg p.o. 100 mg i.v. 300 mg i.v. 100 mg p.o. 300 mg p.o. In general, the ratio of the area under the plasma concentration vs time curve (AUC 0->(infinity) ) between oxypurinol and allopurinol was in the magnitude of 30 to 40. The C max and AUC 0->(infinity) for both allopurinol and oxypurinol following i.v. administration of ALOPRIM (allopurinol sodium) for Injection were dose proportional in the dose range of 100 to 300 mg. The half-life of allopurinol and oxypurinol was not influenced by the route of ALOPRIM (allopurinol sodium) for Injection administration. Oral and intravenous administration of ALOPRIM (allopurinol sodium) for Injection at equal doses produced nearly superimposable oxypurinol plasma concentration vs time profiles, and the relative bioavailability of oxypurinol (F relative ) was approximately 100%. Thus, the pharmacokinetics and plasma profiles of oxypurinol, the major pharmacological component derived from allopurinol, are similar after intravenous and oral administration of ALOPRIM (allopurinol sodium) for Injection. Clinical Trials: A compassionate plea trial was conducted from 1977 through 1989 in which 718 evaluable patients with malignancies requiring treatment with cytotoxic chemotherapy, but who were unable to ingest or retain oral medication, received i.v. ALOPRIM (allopurinol sodium) for Injection in the U.S. Of these patients, 411 had established hyperuricemia and 307 had normal serum urate levels at the time that treatment was initiated. Normal serum uric acid levels were achieved in 68% (reduction of serum uric acid was documented in 93%) of the former, and were maintained throughout chemotherapy in 97% of the latter. Because of the study design, it was not possible to assess the impact of the treatment upon the clinical outcome of the patient groups. ALOPRIM (allopurinol sodium) for Injection is indicated for the management of patients with leukemia, lymphoma, and solid tumor malignancies who are receiving cancer therapy which causes elevations of serum and urinary uric acid levels and who cannot tolerate oral therapy. Patients who have developed a severe reaction to allopurinol should not be restarted on the drug. ALLOPURINOL SHOULD BE DISCONTINUED AT THE FIRST APPEARANCE OF SKIN RASH OR OTHER SIGNS WHICH MAY INDICATE AN ALLERGIC REACTION. In some instances with oral allopurinol, a skin rash may be followed by more severe hypersensitivity reactions such as exfoliative, urticarial, and purpuric lesions as well as Stevens-Johnson syndrome (erythema multiforme exudativum), and/or generalized vasculitis, irreversible hepatotoxicity and, on rare occasions, death. In patients receiving mercaptopurine or azathioprine, the concomitant administration of 300 to 600 mg of ALOPRIM (allopurinol sodium) for Injection per day will require a reduction in dose to approximately one-third to one-fourth of the usual dose of mercaptopurine or azathioprine. Subsequent adjustment of doses of mercaptopurine or azathioprine should be made on the basis of therapeutic response and the appearance of toxic effects (see PRECAUTIONS : Drug Interactions ). A few cases of reversible clinical hepatotoxicity have been noted in patients taking oral allopurinol, and in some patients asymptomatic rises in serum alkaline phosphatase or serum transaminase have been observed. If anorexia, weight loss, or pruritus develop in patients on allopurinol, evaluation of liver function should be part of their diagnostic workup. In patients with pre-existing liver disease, periodic liver function tests are recommended during the early stages of therapy. The occurrence of hypersensitivity reactions to allopurinol may be increased in patients with decreased renal function receiving thiazides and allopurinol concurrently. Thus, in patients with decreased renal function, such combinations should be administered with caution. General: A fluid intake sufficient to yield a daily urinary output of at least two liters in adults and the maintenance of a neutral or, preferably, slightly alkaline urine are desirable to (1) avoid the theoretical possibility of formation of xanthine calculi under the influence of allopurinol therapy and (2) help prevent renal precipitation of urates in patients receiving concomitant uricosuric agents. A few patients with pre-existing renal disease or poor urate clearance have shown a rise in BUN during allopurinol administration, although a decrease in BUN has also been observed. In patients with hyperuricemia due to malignancy, the vast majority of changes in renal function are attributable to the underlying malignancy rather than to therapy with allopurinol. Concurrent conditions such as multiple myeloma and congestive myocardial disease were present among those patients whose renal function deteriorated after allopurinol was begun. Renal failure is rarely associated with hypersensitivity reactions to allopurinol. Patients with decreased renal function do require lower doses of allopurinol. Patients should be carefully observed during the early stages of allopurinol administration so that the dosage can be appropriately adjusted for renal function. In patients with severely impaired renal function or decreased urate clearance, the half-life of oxypurinol in the plasma is greatly prolonged. Patients should be treated with the lowest effective dose, in order to minimize possible side effects. The appropriate dose of ALOPRIM (allopurinol sodium) for Injection for patients with a creatinine clearance </=10 mL/min is 100 mg per day. For patients with a creatinine clearance between 10 and 20 mL/min, a dose of 200 mg per day is recommended. With extreme renal impairment (creatinine clearance less than 3 mL/min), the interval between doses may also need to be extended. Bone marrow suppression has been reported in patients receiving allopurinol; however, most of these patients were receiving concomitant medications with the known potential to cause such an effect. The suppression has occurred from as early as 6 weeks to as long as 6 years after the initiation of allopurinol therapy. Laboratory Tests: The correct dosage and schedule for maintaining the serum uric acid within the normal range is best determined by using the serum uric acid as an index. In patients with pre-existing liver disease, periodic liver function tests are recommended during the early stages of therapy (see WARNINGS ). Allopurinol and its primary active metabolite, oxypurinol, are eliminated by the kidneys; therefore, changes in renal function have a profound effect on dosage. In patients with decreased renal function, or who have concurrent illnesses which can affect renal function such as hypertension and diabetes mellitus, periodic laboratory parameters of renal function, particularly BUN and serum creatinine or creatinine clearance, should be performed and the patient's allopurinol dosage reassessed. The prothrombin time should be reassessed periodically in the patients receiving dicumarol who are given allopurinol. Drug Interactions: The following drug interactions were observed in some patients undergoing treatment with oral allopurinol. Although the pattern of use for oral allopurinol includes longer term therapy, particularly for gout and renal calculi, the experience gained may be relevant. Mercaptopurine/Azathioprine: Allopurinol inhibits the enzymatic oxidation of mercaptopurine and azathioprine to 6-thiouric acid. This oxidation, which is catalyzed by xanthine oxidase, inactivates mercaptopurine. Therefore, the concomitant administration of 300 to 600 mg of oral allopurinol per day will require a reduction in dose to approximately one-third to one-fourth of the usual dose of mercaptopurine or azathioprine. Subsequent adjustment of doses of mercaptopurine or azathioprine should be made on the basis of therapeutic response and the appearance of toxic effects. Dicumarol: It has been reported that allopurinol prolongs the half-life of the anticoagulant, dicumarol. Consequently, prothrombin time should be reassessed periodically in patients receiving both drugs. The clinical basis of this drug interaction has not been established. Uricosuric Agents: Since the excretion of oxypurinol is similar to that of urate, uricosuric agents, which increase the excretion of urate, are also likely to increase the excretion of oxypurinol. As a result, the concomitant administration of uricosuric agents decreases the inhibition of xanthine oxidase by oxypurinol and increases the urinary excretion of uric acid. Thiazide Diuretics: Reports that the concomitant administration of allopurinol and thiazide diuretics contributed to increased allopurinol toxicity were reviewed; a causal mechanism or cause-and-effect relationship was not found. Renal function should be monitored in patients on thiazide diuretics and allopurinol (see WARNINGS ). Ampicillin/Amoxicillin: An increase in the frequency of skin rash has been reported among patients receiving ampicillin or amoxicillin concurrently with allopurinol compared to patients who are not receiving both drugs. The cause of this reaction has not been established. Cytotoxic Agents: Enhanced bone marrow suppression by cyclophosphamide and other cytotoxic agents has been reported among patients with neoplastic disease, except leukemia, in the presence of allopurinol. However, in a well-controlled study of patients with lymphoma on combination therapy, allopurinol did not increase the marrow toxicity of patients treated with cyclophosphamide, doxorubicin, bleomycin, procarbazine, and/or mechlorethamine. Chlorpropamide: The half-life of chlorpropamide in the plasma may be prolonged by allopurinol, since allopurinol and chlorpropamide may compete for excretion in the renal tubule. The risk of hypoglycemia secondary to this mechanism may be increased if allopurinol and chlorpropamide are given concomitantly in the presence of renal insufficiency. Cyclosporin: Reports indicate that cyclosporine levels may be increased during concomitant treatment with ALOPRIM (allopurinol sodium) for Injection. Monitoring of cyclosporine levels and possible adjustment of cyclosporine dosage should be considered when these drugs are co-administered. Drug/Laboratory Test Interactions: Allopurinol is not known to alter the accuracy of laboratory tests. Carcinogenesis: Allopurinol was administered at doses up to 20 mg/kg/day to mice and rats for the majority of their life span. No evidence of carcinogenicity was seen in either mice or rats (at doses about 1/6 or 1/3 the recommended human dose on a mg/m 2 basis, respectively). Mutagenesis: Allopurinol administered intravenously to rats (50 mg/kg) was not incorporated into rapidly replicating intestinal DNA. No evidence of clastogenicity was observed in an in vivo micronucleus test in rats, or in lymphocytes taken from patients treated with allopurinol (mean duration of treatment 40 months), or in an in vitro assay with human lymphocytes. Impairment of Fertility: Allopurinol oral doses of 20 mg/kg/day had no effect on male or female fertility in rats or rabbits (about 1/3 or 1/2 the human dose on a mg/m 2 basis, respectively). Pregnancy: Teratogenic Effects: Pregnancy Category C. There was no evidence of fetotoxicity or teratogenicity in rats or rabbits treated during the period of organogenesis with oral allopurinol at doses up to 200 mg/kg/day and up to 100 mg/kg/day, respectively (about three times the human dose on a mg/m 2 basis). However, there is a published report in pregnant mice that single intraperitoneal doses of 50 or 100 mg/kg (about 1/3 or 3/4 the human dose on a mg/m 2 basis) of allopurinol on gestation days 10 or 13 produced significant increases in fetal deaths and teratogenic effects (cleft palate, harelip, and digital defects). It is uncertain whether these findings represented a fetal effect or an effect secondary to maternal toxicity. There are, however, no adequate or well-controlled studies in pregnant women. Because animal reproduction studies are not always predictive of human response, this drug should be used during pregnancy only if the potential benefit justifies the potential risk to the fetus. Experience with allopurinol during human pregnancy has been limited partly because women of reproductive age rarely require treatment with allopurinol. Two unpublished reports and one published paper describe women giving birth to normal offspring after receiving oral allopurinol during pregnancy. There have been no pregnancies reported in patients receiving ALOPRIM (allopurinol sodium) for Injection, but it is assumed that the same risks would apply. Nursing Mothers: Allopurinol and oxypurinol have been found in the milk of a mother who was receiving allopurinol. Since the effect of allopurinol on the nursing infant is unknown, caution should be exercised when allopurinol is administered to a nursing woman. Pediatric Use: Clinical data are available on approximately 200 pediatric patients treated with ALOPRIM (allopurinol sodium) for Injection. The efficacy and safety profile observed in this patient population were similar to that observed in adults (see INDICATIONS AND USAGE and DOSAGE AND ADMINISTRATION ). Geriatric Use: Clinical studies of ALOPRIM (allopurinol sodium) for Injection did not include sufficient numbers of patients aged 65 and over to determine whether they respond differently than younger patients. Other reported clinical experience has not identified differences in responses between the elderly and younger patients. In general, dose selection for an elderly patient should be cautious, usually starting at the low end of the dosing range, reflecting the greater frequency of decreased hepatic, renal, or cardiac function, and of concomitant disease or other drug therapy. In an uncontrolled, compassionate plea protocol, 125 of 1,378 patients reported a total of 301 adverse reactions while receiving ALOPRIM (allopurinol sodium) for Injection. Most of the patients had advanced malignancies or serious underlying diseases and were taking multiple concomitant medications. Side effects directly attributable to ALOPRIM (allopurinol sodium) for Injection were reported in 19 patients. Fifteen of these adverse experiences were allergic in nature (rash, eosinophilia, local injection site reaction). One adverse experience of severe diarrhea and one incidence of nausea were also reported as being possibly attributable to ALOPRIM (allopurinol sodium) for Injection. Two patients had serious adverse experiences (decreased renal function and generalized seizure) reported as being possibly attributable to ALOPRIM (allopurinol sodium) for Injection. The most frequent adverse reaction to oral allopurinol is skin rash. Skin reactions can be severe and sometimes fatal. Therefore, treatment with ALOPRIM (allopurinol sodium) for Injection should be discontinued immediately if a rash develops (see WARNINGS ). For further details on hypersensitivity reactions to treatment with oral allopurinol, refer to the package insert for allopurinol tablets. Massive overdosing or acute poisoning by ALOPRIM (allopurinol sodium) for Injection has not been reported. In mice, the minimal lethal dose is 45 mg/kg given intravenously or 500 mg/kg orally (about 1/3 or 4 times the usual human dose on a mg/m 2 basis). Hypoactivity was observed with these doses. In rats, the minimum lethal dose is 100 mg/kg i.v., and 5000 mg/kg orally (about 1.5 and 75 times the usual human dose on a mg/m 2 basis). In the management of overdosage, there is no specific antidote for ALOPRIM (allopurinol sodium) for Injection. There has been no clinical experience in the management of a patient who has taken massive amounts of allopurinol. Both allopurinol and oxypurinol are dialyzable; however, the usefulness of hemodialysis or peritoneal dialysis in the management of an overdose of ALOPRIM (allopurinol sodium) for Injection is unknown. Hydration: A fluid intake sufficient to yield a daily urinary output of at least two liters in adults and the maintenance of a neutral or, preferably, slightly alkaline urine are desirable. 6-, 8-, or 12- hour intervals at the recommended final concentration of not greater than 6 mg/mL (see Preparation of Solution ). The rate of infusion depends on the volume of infusate. Whenever possible, therapy with ALOPRIM (allopurinol sodium) for Injection should be initiated 24 to 48 hours before the start of chemotherapy known to cause tumor cell lysis (including adrenocortico steroids). ALOPRIM (allopurinol sodium) for Injection should not be mixed with or administered through the same intravenous port with agents which are incompatible in solution with ALOPRIM (allopurinol sodium) for Injection (see Preparation of Solution ). Preparation of Solution: ALOPRIM (allopurinol sodium) for Injection must be reconstituted and diluted. The contents of each 30 mL vial should be dissolved with 25 mL of Sterile Water for Injection. Reconstitution yields a clear, almost colorless solution with no more than a slight opalescence. This concentrated solution has a pH of 11.1 to 11.8. It should be diluted to the desired concentration with 0.9% Sodium Chloride Injection or 5% Dextrose for Injection. Sodium bicarbonate-containing solutions should not be used. A final concentration of no greater than 6 mg/mL is recommended. The solution should be stored at 20° to 25°C (68° to 77°F) and administration should begin within 10 hours after reconstitution. Do not refrigerate the reconstituted and/or diluted product. STERILE SINGLE USE VIAL FOR INTRAVENOUS INFUSION. ALOPRIM (allopurinol sodium) for Injection, 30 mL flint glass vials with rubber stoppers each containing allopurinol sodium equivalent to 500 mg of allopurinol (white lyophilized powder), box of 1 (NDC 59730-5601-1). Store unreconstituted powder at 25°C (77°F); excursions permitted to 15°-30°C (59°-86°F) [see USP controlled room temperature].